Another year is almost coming to an end, Halloween reminds me of end of the year, every year. 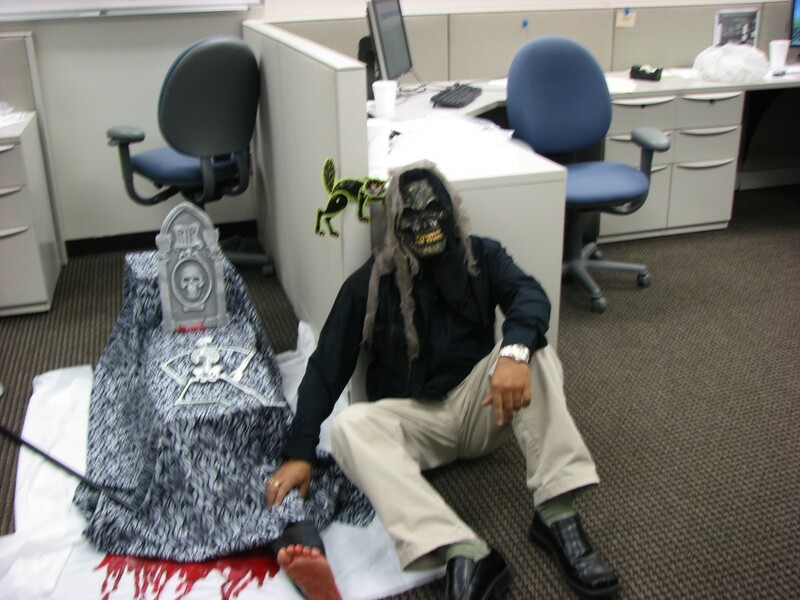 The picture below is mine in Halloween costume, circa 2007 in Austin, TX. I am with our award-winning frugal Halloween theme decoration at work. SMB always tells me to use pictures from our own camera instead of painstaking search for a reusable image. I was pondering for last few days, for this post I couldn’t found a better image than this. Personal story and personal pictures make a powerful personal blog post. The mask I am wearing is a $10 mask I brought a year before just next day after Halloween for mere $2. Hence, this is a $2 Halloween costume for me. The display you see in the picture, is a decoration created by our team of software developers (8 of us in a project team of 100). We only spent $20 bucks for this decoration, RIP plastic marble, a paper skeleton, a paper cat, some artificial blood and a plastic human leg. Everything came from Wal-Mart the night before the Halloween with a cost of $2.5 per person. I contributed with the white sheet and others in my team brought in with black -and-white sheet and cardboard boxes from home. Let me now show you the extravagant spent by other teams who participated in the contest. 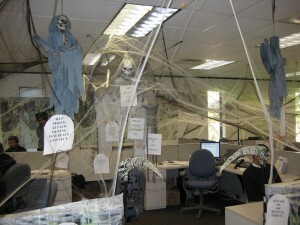 These were quiet costly decoration. 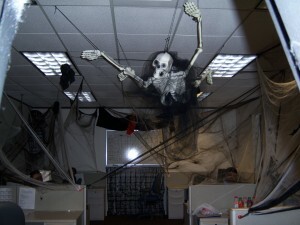 Each of the above two teams spent more than $100 towards the decoration. They had talking ghosts, waking cats and what not. At the end, our team won the title for most innovative theme. Off-course, we did advertise our low-cost factor to the judges to get as much credit as possible. The idea behind this personal story is to establish the fact that frugal ways are often the best way to do things. I read two frugal Halloween posts last week. Family Money Values wrote about teaching money to young kids this Halloween, a lot of things to learn from this post. My reader will tell how fond of I am towards Entrepreneurship, Afford Anything presented the article of my choice “Stop crying for lack of jobs, create one“. Dear readers, I was raised in a society of strongest parent – children relationship, where parents always pay for children’s education and children take care of parents during retirement. I realize that I am living in a different society when I read a post discussing whether we should pay for our children’s education at Parenting Squad. For me this should be the norm but, societies are different across the world. America is different from India. 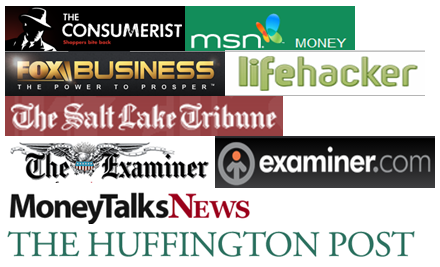 Free From Broke presented useful tips to re-mediate credit report errors. A how-to guide, which I know I would need at some point of time. Michael Hyatt presents 7 ways a life plan is like a GPS system. always routing and re routing to the ultimate destination even if you deviate on the way. At the end, the best I read, not only this week, but the whole month. It’s not about finance rather, it’s a personal story which touches the heart. Chat History. Rebecca we are with you! I had my first interview published at Smart Family Finance this week, if interested head over to read my take on the differences between American way of personal finance and Indian way of personal finance. Great story – I used to love it when departments would decorate and compete with each other at work. Thanks for linking SB. Your interview was one of the best yet! Thanks Shaun, thanks for giving opportunity to express myself. Thanks for sharing your Halloween story with us. 🙂 Great story.